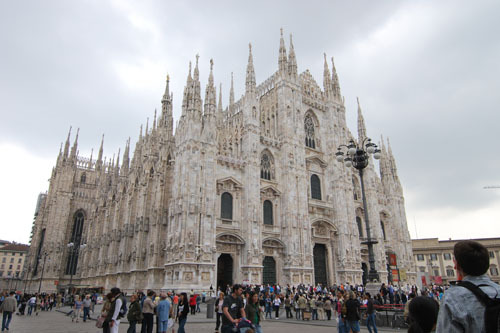 Adorned with 135 marble spires and 2,245 marble statues, this magnficently intricate Gothic structure was begun in 1386 by Galeazzo Visconti III (1351-1402), the first duke of Milan. It was not expanded until 1809, when Napoleon decided it was just the place for his coronation as King of Italy. Restoration is an ongoing concern in a structure such as this and, indeed, the most wide-ranging sprucing-up operation ever has been going on for several years now. Inside the duomo the floors are of complex patterned marble and light streams in through the jewel-like stained-glass windows. Don’t miss Mark Wallinger’s evocative Via Dolorosa in the Treasury, a flickering metaphor for Christ’s last journey to the cross. On a clear day, take the elevator (the entrance is craftily hidden on the outside left-hand wall of the cathedral) up among the statuary for unrivalled views over the city to the mountains in the north. The newest and shiniest of Milan’s museums opened in November 2013 on the ground floor of the Palazzo Reale, just to the right of the Duomo (cathedral) on the city’s central piazza. 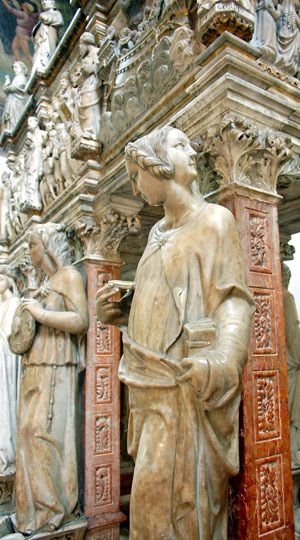 This cleverly curated and fascinating exhibition showcases innumerable treasures sourced from the Duomo between its foundation in 1307 and present day, displayed in chronological order. Darkened rooms full of carved stone angels compete for attention with Renaissance sculptures of the Madonna, bejeweled crucifixes and tapestries; there’s a startling cluster of ugly gargoyles and some lovely 15th-century stained-glass as well as wooden models of the cathedral. Take a seat at one of the cafes in the glorious Galleria Vittorio Emanuele, sip a drink, eat an ice, or sample a snack, and watch the world go by. Be warned that sitting outdoors will cost at least $10 per person! The choice goes from Biffi, a long-established café that in the early part of the twentieth century, was even featured in paintings by the Italian Futurists, to the Gucci café, a bijou space outside the eponymous store. Zucca is perhaps the most famous cafe. 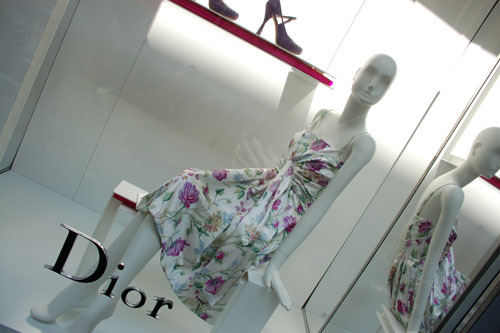 Before you leave, take a peek at some of the stores that grace the Galleria. The original Prada store – dating from 1913 – is lovely, while relative newcomers such as Louis Vuitton, Gucci and Tod’s, offer lots of opportunities to acquire lovely gifts for friends back home. Dance on the private parts of the bull mosaic for an intoxicating round of good luck! Claim your bella figura to brave the hallowed network of shopping streets in the Quad d’Oro, Italy’s premier designer shopping area. If it’s Gucci, Prada, YSL, or Versace you‘re after, here’s your natural habitat. 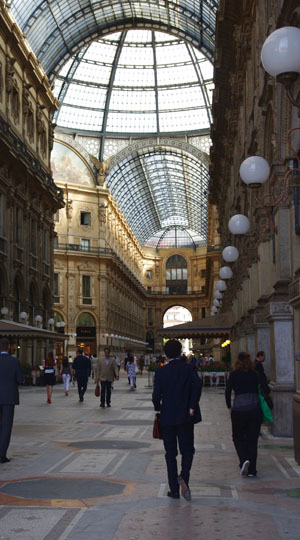 Shop for logo-ed belts, bags and shoes in a series of extravagantly expensive boutiques just north of the Duomo. Watch the Milanese smart set stalk past, take home beautifully gilded and colored glass from Vetrerie di Empoli and stop off for a pitstop espresso at Gran Caffè Cova (both on Via Montenapoleone) when your credit cards are all worn out. 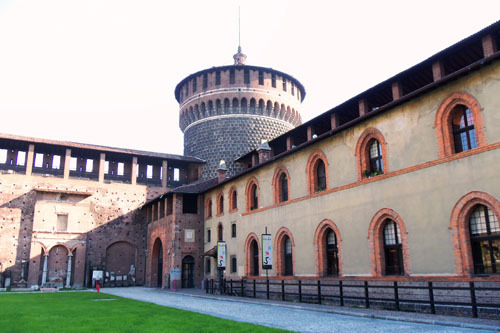 Milan’s castle is a tranquil place where you can walk and relax, see a museum or six if you have the time, or just sit and watch the world go by for a while. A veritable feast of crenellations, machicolations and watchtowers, the castle has filled several roles over the last seven centuries. In the 14th and 15th, it was home to the Dukes of Milan, an army barracks from the 16th to the 19th, and is a museum of museums today. No fewer than seven of them. Pick and choose: bypass the uninspiring collection of Egyptian mummies to enjoy the matchless artwork in the Museo d’Arte Antica, including Michelangelo’s unfinished and highly emotive Rondanini Pietà, beautifully presented against a background of dark slate. On the first floor of the palace you’ll find a collection of regal furniture and a picture gallery overflowing with religious paintings; look out for Jusepe de Ribera’s spectral Holy Hermit and two vast Venetian scenes by Canaletto. On trendy Corso di Porta Ticinese, this splendid basilica has a museum bulging with church artifacts and an almost-surreal chapel in the chapterhouse. Originally built in the 11th century, Sant’Eustorgio has been much reworked over the years; the present Neo-Romanesque façade dates from 1865. The museum entrance is to the left of the basilica’s main door, close to the Paleo-Christian cemetery discovered under the church in the 1960s. The chapterhouse of the Dominican monastery and sacristy contain gold and silver reliquaries, tapestries, and crucifixes. Wander through frescoed St Paul’s and St Francis’s chapels to the extraordinary 15th-century Cappella Portinari, built by Florentine banker Pigello Portinari as memorial to St Peter. 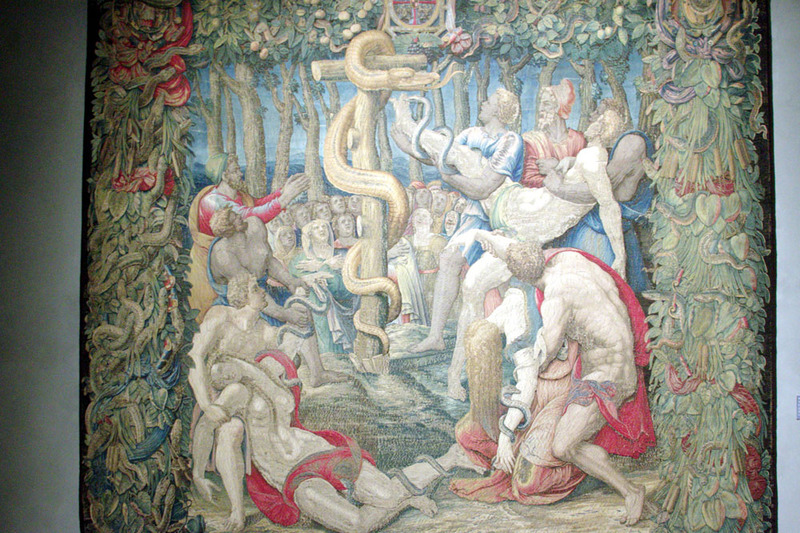 The domed roof looks like acid-colored snakeskin and the walls were frescoed by Vincent Foppa (c.1430–c.1515) with scenes from the lives of the Virgin Mary and St Peter. The elaborate marble Arca di San Pietro Martiri dominating this chapel houses St Peter’s remains; it is the masterpiece of Pisan sculptor Giovanni Balduccio (c.1290–1339) and consists of an ark supported by five red marble columns and statues of the Virtues. The foundations of the original 4th-century church are behind the altar in the present basilica, which contains the purported relics of the three wise men in the Sarcophagus of the Magi.